Chris is an applied mathematician interested in modeling a variety of physical, biological, and social phenomenon. He has applied principles of chaos theory to improve weather forecasts as a member of the Mathematics and Climate Research Network, and developed a real-time remote sensor of global happiness using messages from Twitter: the Hedonometer. Danforth co-runs the Computational Story Lab with Peter Dodds. Meredith Niles, Benjamin Emery, Andy Reagan, Peter Sheridan Dodds, Chris Danforth. PLoS ONE, , , 2019. Natural hazards are becoming increasingly expensive as climate change and development are exposing communities to greater risks. Preparation and recovery are critical for climate change resilience, and social media are being used more and more to communicate before, during, and after disasters. While there is a growing body of research aimed at understanding how people use social media surrounding disaster events, most existing work has focused on a single disaster case study. In the present study, we analyze five of the costliest disasters in the last decade in the United States (Hurricanes Irene and Sandy, two sets of tornado outbreaks, and flooding in Louisiana) through the lens of Twitter. In particular, we explore the frequency of both generic and specific food-security related terms, and quantify the relationship between network size and Twitter activity during disasters. We find differences in tweet volume for keywords depending on disaster type, with people using Twitter more frequently in preparation for Hurricanes, and for real-time or recovery information for tornado and flooding events. Further, we find that people share a host of general disaster and specific preparation and recovery terms during these events. Finally, we find that among all account types, individuals with “average” sized networks are most likely to share information during these disasters, and in most cases, do so more frequently than normal. This suggests that around disasters, an ideal form of social contagion is being engaged in which average people rather than outsized influentials are key to communication. These results provide important context for the type of disaster information and target audiences that may be most useful for disaster communication during varying extreme events. Chris Danforth, Brian Tivnan, Colin Van Oort, David Dewhurst, Tyler Gray, John H. Ring IV. Preprint, 2019. Using the most comprehensive, commercially-available dataset of trading activity in U.S. equity markets, we catalog and analyze latency arbitrage opportunities and realized opportunity costs (ROC) incurred by market participants. We find that latency arbitrage opportunities are common, observing a total of over 3.1 billion latency arbitrage opportunities in the Russell 3000 during trading in 2016, or roughly 525 per second of trading. Up to 23% of observed trades may have contributed the the measured inefficiencies, leading to a ROC greater than $2 billion USD. A subset of the constituents of the S&P 500 index experience the greatest amount of ROC and may drive inefficiencies in other stocks. In addition, we identify fine structure and self-similarity in the intra-day distribution of latency arbitrage opportunity start times. These results point to universal underlying market mechanisms arising from the physical structure of the U.S. National Market System. Chris Danforth, Peter Sheridan Dodds, Andy Reagan, Tyler Gray. PLoS ONE, , , 2018. Aaron Schwartz, Peter Sheridan Dodds, Jarlath O'Neil-Dunne, Chris Danforth, Taylor Ricketts. Preprint, 2018. Urbanization and the decline of access to nature have coincided with a rise of mental health problems. A growing body of research has demonstrated an association between nature contact and improved mental affect (ie, mood). However, previous approaches have been unable to quantify the benefits of urban greenspace exposure and compare how different types of outdoor public spaces impact mood. Here, we use Twitter to investigate how mental affect varies before, during, and after visits to a large urban park system. We analyze the sentiment of tweets to estimate the magnitude and duration of the affect benefit of visiting parks. We find that affect is substantially higher during park visits and remains elevated for several hours following the visit. Visits to Regional Parks, which are greener and have greater vegetative cover, result in a greater increase in affect compared to Civic Plazas and Squares. Finally, we analyze the words in tweets around park visits to explore several theorized mechanisms linking nature exposure with mental and cognitive benefits. Negation words such as" no"," not", and" don't" decrease in frequency during visits to urban parks. These results point to the most beneficial types of nature contact for mental health benefits and can be used by urban planners and public health officials to improve the well-being of growing urban populations. David Rushing Dewhurst, Chris Danforth, Peter Sheridan Dodds. Physical Review E, , 97, 2018. Classical rich-get-richer models have found much success in being able to broadly reproduce the statistics and dynamics of diverse real complex systems. These rich-get-richer models are based on classical urn models and unfold step-by-step in discrete time. Here, we consider a natural variation acting on a temporal continuum in the form of a partial differential equation (PDE). We first show that the continuum version of Herbert Simon's canonical preferential attachment model exhibits an identical size distribution. In relaxing Simon's assumption of a linear growth mechanism, we consider the case of an arbitrary growth kernel and find the general solution to the resultant PDE. We then extend the PDE to multiple spatial dimensions, again determining the general solution. Finally, we apply the model to size and wealth distributions of firms. We obtain power law scaling for both to be concordant with simulations as well as observational data. Ryan Gallagher, Andy Reagan, Chris Danforth, Peter Sheridan Dodds. PLoS ONE, e0195644, 13, 2016. Since the shooting of Black teenager Michael Brown by White police officer Darren Wison in Ferguson, Missouri, the protest hashtag #BlackLivesMatter has amplified critiques of extrajudicial killings of Black Americans. In response to #BlackLivesMatter, other Twitter users have adopted #AllLivesMatter, a counter-protest hashtag whose content argues that equal attention should be given to all lives regardless of race. Through a multi-level analysis, we study how these protests and counter-protests diverge by quantifying aspects of their discourse. In particular, we introduce methodology that not only quantifies these divergences, but also reveals whether they are from widespread discussion or a few popular retweets within these groups. We find that #BlackLivesMatter exhibits many informationally rich conversations, while those within #AllLivesMatter are more muted and susceptible to hijacking. We also show that the discussion within #BlackLivesMatter is more likely to center around the deaths of Black Americans, while that of #AllLivesMatter is more likely to sympathize with the lives of police officers and express politically conservative views. Andrew G. Reece, Chris Danforth, Andy Reagan, Katharina L. M. Lix, Peter Sheridan Dodds, Ellen Langer. Scientific Reports, , , 2017. We developed computational models to predict the emergence of depression and Post-Traumatic Stress Disorder in Twitter users. Twitter data and details of depression history were collected from 204 individuals (105 depressed, 99 healthy). We extracted predictive features measuring affect, linguistic style, and context from participant tweets (N=279,951) and built models using these features with supervised learning algorithms. Resulting models successfully discriminated between depressed and healthy content, and compared favorably to general practitioners' average success rates in diagnosing depression. Results held even when the analysis was restricted to content posted before first depression diagnosis. State-space temporal analysis suggests that onset of depression may be detectable from Twitter data several months prior to diagnosis. Predictive results were replicated with a separate sample of individuals diagnosed with PTSD (174 users, 243,775 tweets). A state-space time series model revealed indicators of PTSD almost immediately post-trauma, often many months prior to clinical diagnosis. These methods suggest a data-driven, predictive approach for early screening and detection of mental illness. Chris Danforth, Andrew G. Reece. EPJ Data Science, , , 2017. Jim Bagrow, Chris Danforth, Lewis Mitchell. ACM, 103-108, , 2017. The friendship paradox states that in a social network, egos tend to have lower degree than their alters, or, "your friends have more friends than you do". Most research has focused on the friendship paradox and its implications for information transmission, but treating the network as static and unweighted. Yet, people can dedicate only a finite fraction of their attention budget to each social interaction: a high-degree individual may have less time to dedicate to individual social links, forcing them to modulate the quantities of contact made to their different social ties. Here we study the friendship paradox in the context of differing contact volumes between egos and alters, finding a connection between contact volume and the strength of the friendship paradox. The most frequently contacted alters exhibit a less pronounced friendship paradox compared with the ego, whereas less-frequently contacted alters are more likely to be high degree and give rise to the paradox. We argue therefore for a more nuanced version of the friendship paradox: "your closest friends have slightly more friends than you do", and in certain networks even: "your best friend has no more friends than you do". We demonstrate that this relationship is robust, holding in both a social media and a mobile phone dataset. These results have implications for information transfer and influence in social networks, which we explore using a simple dynamical model. Mark Ibrahim, Peter Sheridan Dodds, Chris Danforth. Journal of Computational Science, 21-30, 19, 2017. Apples, porcupines, and the most obscure Bob Dylan song—is every topic a few clicks from Philosophy? Within Wikipedia, the surprising answer is yes: nearly all paths lead to Philosophy. Wikipedia is the largest, most meticulously indexed collection of human knowledge ever amassed. More than information about a topic, Wikipedia is a web of naturally emerging relationships. By following the first link in each article, we algorithmically construct a directed network of all 4.7 million articles: Wikipedia’s First Link Network. Here, we study the English edition of Wikipedia’s First Link Network for insight into how the many articles on inventions, places, people, objects, and events are related and organized. By traversing every path, we measure the accumulation of first links, path lengths, groups of path-connected articles, cycles, and the influence each article exerts in shaping the network. We find scale-free distributions describe path length, accumulation, and influence. Far from dispersed, first links disproportionately accumulate at a few articles—flowing from specific to general and culminating around fundamental notions such as Community, State, and Science. Philosophy directs more paths than any other article by two orders of magnitude. We also observe a gravitation towards topical articles such as Health Care and Fossil Fuel. These findings enrich our view of the connections and structure of Wikipedia’s ever growing store of knowledge. Emily Cody, Jennie Stephens, Jim Bagrow, Peter Sheridan Dodds, Chris Danforth. Journal of Environmental Studies and Sciences, 87-101, 7, 2017. Although climate change and energy are intricately linked, their explicit connection is not always prominent in public discourse and the media. Disruptive extreme weather events, including hurricanes, focus public attention in new and different ways offering a unique window of opportunity to analyze how a focusing event influences public discourse. Media coverage of extreme weather events simultaneously shapes and reflects public discourse on climate issues. Here, we analyze climate and energy newspaper coverage of Hurricanes Katrina (2005) and Sandy (2012) using topic models, mathematical techniques used to discover abstract topics within a set of documents. Our results demonstrate that post-Katrina media coverage does not contain a climate change topic, and the energy topic is limited to discussion of energy prices, markets, and the economy with almost no explicit linkages made between energy and climate change. In contrast, post-Sandy media coverage does contain a prominent climate change topic, a distinct energy topic, as well as integrated representation of climate change and energy, indicating a shift in climate and energy reporting between Hurricane Katrina and Hurricane Sandy. Andy Reagan, Lewis Mitchell, Dilan Kiley, Chris Danforth, Peter Sheridan Dodds. EPJ Data Science, 31, 5, 2016. Joshua Bongard, Chris Danforth. 2016. This award supported extensions to, and novel applications of, an increasingly useful machine learning methodology known as symbolic regression. The PI of this award was involved in earlier work that established this approach as a powerful method for discovering previously unknown relationships within and among arbitrary data sets. Tom McAndrew, Joshua Bongard, Chris Danforth, Peter Sheridan Dodds, Paul Hines, Jim Bagrow. Advances in Social Networks Analysis and Mining (ASONAM), 2016 IEEE/ACM International Conference on, 519-524, , 2016. Identifying and communicating relationships between causes and effects is important for understanding our world, but is affected by language structure, cognitive and emotional biases, and the properties of the communication medium. Despite the increasing importance of social media, much remains unknown about causal statements made online. To study real-world causal attribution, we extract a large-scale corpus of causal statements made on the Twitter social network platform as well as a comparable random control corpus. We compare causal and control statements using statistical language and sentiment analysis tools. We find that causal statements have a number of significant lexical and grammatical differences compared with controls and tend to be more negative in sentiment than controls. Causal statements made online tend to focus on news and current events, medicine and health, or interpersonal relationships, as shown by topic models. By quantifying the features and potential biases of causality communication, this study improves our understanding of the accuracy of information and opinions found online. Emily Cody, Andy Reagan, Peter Sheridan Dodds, Chris Danforth. Preprint, 2016. Solicited public opinion surveys reach a limited subpopulation of willing participants and are expensive to conduct, leading to poor time resolution and a restricted pool of expert-chosen survey topics. In this study, we demonstrate that unsolicited public opinion polling through sentiment analysis applied to Twitter correlates well with a range of traditional measures, and has predictive power for issues of global importance. We also examine Twitter’s potential to canvas topics seldom surveyed, including ideas, personal feelings, and perceptions of commercial enterprises. Two of our major observations are that appropriately filtered Twitter sentiment (1) predicts President Obama’s job approval three months in advance, and (2) correlates well with surveyed consumer sentiment. To make possible a full examination of our work and to enable others’ research, we make public over 10,000 data sets, each a seven-year series of daily word counts for tweets containing a frequently used search term. Peter Sheridan Dodds, Lewis Mitchell, Andy Reagan, Chris Danforth. PLoS ONE, e0154184, 11 (5), 2016. Instabilities and long term shifts in seasons, whether induced by natural drivers or human activities, pose great disruptive threats to ecological, agricultural, and social systems. Here, we propose, quantify, and explore two fundamental markers of seasonal variations: the Summer and Winter Teletherms—the on-average annual dates of the hottest and coldest days of the year. We analyse daily temperature extremes recorded at 1218 stations across the contiguous United States from 1853–2012 to obtain estimates of the Teletherms, and to characterize their spatial and temporal dynamics. We observe substantial regional variation with the Summer Teletherm falling up to 90 days after the Summer Solstice, and 50 days for the Winter Teletherm after the Winter Solstice, and that in many locations, the Teletherm is better described as one or more sequences of dates—the Teletherm Period. We show Teletherm temporal dynamics are substantive with clear and in some cases dramatic changes moving across broad regions, suggesting links to climate change. We also compare recorded daily temperature extremes with output from two weather models finding considerable though relatively unbiased error. Dilan Kiley, Andy Reagan, Lewis Mitchell, Chris Danforth, Peter Sheridan Dodds. Physical Review E, , , 2016. Sports are spontaneous generators of stories. Through skill and chance, the script of each game is dynamically written in real time by players acting out possible trajectories allowed by a sport's rules. By properly characterizing a given sport's ecology of `game stories', we are able to capture the sport's capacity for unfolding interesting narratives, in part by contrasting them with random walks. Here, we explore the game story space afforded by a data set of 1,310 Australian Football League (AFL) score lines. We find that AFL games exhibit a continuous spectrum of stories and show how coarse-graining reveals identifiable motifs ranging from last minute comeback wins to one-sided blowouts. Through an extensive comparison with a random walk null model, we show that AFL games are superdiffusive and deliver a much broader array of motifs, and we provide consequent insights into the narrative appeal of real games. Andy Reagan, Yves Dubief, Peter Sheridan Dodds, Chris Danforth. PLoS ONE, , , 2015. A thermal convection loop is a annular chamber filled with water, heated on the bottom half and cooled on the top half. With sufficiently large forcing of heat, the direction of fluid flow in the loop oscillates chaotically, dynamics analogous to the Earth’s weather. As is the case for state-of-the-art weather models, we only observe the statistics over a small region of state space, making prediction difficult. To overcome this challenge, data assimilation (DA) methods, and specifically ensemble methods, use the computational model itself to estimate the uncertainty of the model to optimally combine these observations into an initial condition for predicting the future state. Here, we build and verify four distinct DA methods, and then, we perform a twin model experiment with the computational fluid dynamics simulation of the loop using the Ensemble Transform Kalman Filter (ETKF) to assimilate observations and predict flow reversals. We show that using adaptively shaped localized covariance outperforms static localized covariance with the ETKF, and allows for the use of less observations in predicting flow reversals. We also show that a Dynamic Mode Decomposition (DMD) of the temperature and velocity fields recovers the low dimensional system underlying reversals, finding specific modes which together are predictive of reversal direction. Emily Cody, Andy Reagan, Lewis Mitchell, Peter Sheridan Dodds, Chris Danforth. PLoS ONE, e0136092, 10, 2015. The consequences of anthropogenic climate change are extensively debated through scientific papers, newspaper articles, and blogs. Newspaper articles may lack accuracy, while the severity of findings in scientific papers may be too opaque for the public to understand. Social media, however, is a forum where individuals of diverse backgrounds can share their thoughts and opinions. As consumption shifts from old media to new, Twitter has become a valuable resource for analyzing current events and headline news. In this research, we analyze tweets containing the word “climate” collected between September 2008 and July 2014. We determine how collective sentiment varies in response to climate change news, events, and natural disasters. Words uncovered by our analysis suggest that responses to climate change news are predominately from climate change activists rather than climate change deniers, indicating that Twitter is a valuable resource for the spread of climate change awareness. Kathleen E. Brummel-Ziedins, Chris Danforth, Thomas Orfeo, Stephen J. Everse, Kenneth Mann. US Patent, , 14411362, 2015. Featured is a method for assessing risk of a patient condition. Such a method includes providing criteria that relate predetermined parameters to each other, inputting observations into given criterion and relating observations of one or more acquired parameters, and converging the given criterion so as to provide an output representative of a patient condition. Such a method further includes translating the output into a visual form such as displaying the output on a display device. Tom McAndrew, Chris Danforth, Jim Bagrow. Physical Review E, , , 2015. Power lines, roadways, pipelines, and other physical infrastructure are critical to modern society. These structures may be viewed as spatial networks where geographic distances play a role in the functionality and construction cost of links. Traditionally, studies of network robustness have primarily considered the connectedness of large, random networks. Yet for spatial infrastructure, physical distances must also play a role in network robustness. Understanding the robustness of small spatial networks is particularly important with the increasing interest in microgrids, i.e., small-area distributed power grids that are well suited to using renewable energy resources. We study the random failures of links in small networks where functionality depends on both spatial distance and topological connectedness. By introducing a percolation model where the failure of each link is proportional to its spatial length, we find that when failures depend on spatial distances, networks are more fragile than expected. Accounting for spatial effects in both construction and robustness is important for designing efficient microgrids and other network infrastructure. William F. Louisos, Darren Lee Hitt, Chris Danforth. International Journal of Heat and Mass Transfer, , , 2015. This computational study investigates nonlinear dynamics of unstable convection in a 3D toroidal shaped thermal convection loop (i.e., thermosyphon) with heat flux boundary conditions; results are compared to prior 2D simulations. The lower half of the thermosyphon is subjected to a positive heat flux into the system while the upper half is cooled by an equal-but-opposite heat flux out of the system. Water is employed as the working fluid with fully temperature dependent thermophysical properties and the system of governing equations is solved using a finite volume method. Numerical simulations are performed for varying magnitudes of heat flux View the MathML source to yield Rayleigh numbers (i.e., buoyant forcing) ranging from 2.83×104⩽Ra⩽2.83×108 . Delineation of multiple convective flow regimes is achieved through evolution of the bulk-mass-flow time-series and the trajectory of the mass flow attractor. Simulation results demonstrate that multiple regimes are possible and include: (1) conduction, (2) damped, stable convection that asymptotes to steady-state, (3) unstable, Lorenz-like chaotic convection with flow reversals, and (4) high Rayleigh, aperiodic stable convection without flow reversals. For the Rayleigh numbers considered, it is observed that certain flow regimes are not accessible in toroidal simulations owing to the constraints of additional surface boundaries in a 3D system. The RMS of mass flow rate, power spectra of oscillatory behavior, dominant oscillatory frequency, and residence time are also described as a function of the buoyant forcing in the system. Chris Jones, Diann E. Gaalema, T.J. White, Ryan Redner, Peter Sheridan Dodds, Chris Danforth. Value in Health, , 17, 2014. Twitter, a popular social media outlet, has become a useful tool for the study of social behavior through user interactions called tweets. The location time, and message content of tweets provide invaluable social and demographic information for an applied comparison of social behaviors across the world. Our goal is to determine the density and sentiment surrounding tobacco and e-cigarette tweets and link prevalence of word choices to tobacco and e-cigarette use at various localities. Cathy Bliss, Chris Danforth, Peter Sheridan Dodds. PLoS ONE, , , 2014. Complex networks underlie an enormous variety of social, biological, physical, and virtual systems. A profound complication for the science of complex networks is that in most cases, observing all nodes and all network interactions is impossible. Previous work addressing the impacts of partial network data is surprisingly limited, focuses primarily on missing nodes, and suggests that network statistics derived from subsampled data are not suitable estimators for the same network statistics describing the overall network topology. We generate scaling methods to predict true network statistics, including the degree distribution, from only partial knowledge of nodes, links, or weights. Our methods are transparent and do not assume a known generating process for the network, thus enabling prediction of network statistics for a wide variety of applications. We validate analytical results on four simulated network classes and empirical data sets of various sizes. We perform subsampling experiments by varying proportions of sampled data and demonstrate that our scaling methods can provide very good estimates of true network statistics while acknowledging limits. Lastly, we apply our techniques to a set of rich and evolving large-scale social networks, Twitter reply networks. Based on 100 million tweets, we use our scaling techniques to propose a statistical characterization of the Twitter Interactome from September 2008 to November 2008. Our treatment allows us to find support for Dunbar's hypothesis in detecting an upper threshold for the number of active social contacts that individuals maintain over the course of one week. Chris Danforth, Jeffrey S. Marshall, Owen D. Myers, Junru Wu. Journal of Applied Physics, , , 2014. The spatio-temporally periodic (STP) potential is interesting in Physics due to the intimate coupling between its time and spatial components. In this paper, we begin with a brief discussion of the dynamical behaviors of a single particle in a STP potential and then examine the dynamics of multiple particles interacting in a STP potential via the electric Coulomb potential. For the multiple particles' case, we focus on the occurrence of bifurcations when the amplitude of the STP potential varies. It is found that the particle concentration of the system plays an important role; the type of bifurcations that occur and the number of attractors present in the Poincaré sections depend on whether the number of particles in the simulation is even or odd. In addition to the nonlinear dynamical approach, we also discuss dependence of the squared fractional deviation of particles' kinetic energy of the multiple particle system on the amplitude of the STP potential which can be used to elucidate certain transitions of states; this approach is simple and useful particularly for experimental studies of complicated interacting systems. Chris Danforth, Peter Sheridan Dodds. 2014. Cathy Bliss, Chris Danforth, Morgan Frank, Peter Sheridan Dodds. Journal of Computational Science, 750-764, 5, 2014. Many real world, complex phenomena have underlying structures of evolving networks where nodes and links are added and removed over time. A central scientific challenge is the description and explanation of network dynamics, with a key test being the prediction of short and long term changes. For the problem of short-term link prediction, existing methods attempt to determine neighborhood metrics that correlate with the appearance of a link in the next observation period. Recent work has suggested that the incorporation of user-specific metadata and usage patterns can improve link prediction, however methodologies for doing so in a systematic way are largely unexplored in the literature. Here, we provide an approach to predicting future links by applying an evolutionary algorithm to weights which are used in a linear combination of sixteen neighborhood and node similarity indices. We examine Twitter reciprocal reply networks constructed at the time scale of weeks, both as a test of our general method and as a problem of scientific interest in itself. Our evolved predictors exhibit a thousand-fold improvement over random link prediction with high levels of precision for the top twenty predicted links, to our knowledge strongly outperforming all extant methods. Based on our findings, we suggest possible factors which may be driving the evolution of Twitter reciprocal reply networks. Chris Danforth, Lewis Mitchell, Morgan Frank. International Journal of Bifurcation and Chaos, 1430027, 24, 2014. The Lorenz '96 model is an adjustable dimension system of ODEs exhibiting chaotic behavior representative of dynamics observed in the Earth's atmosphere. In the present study, we characterize statistical properties of the chaotic dynamics while varying the degrees of freedom and the forcing. Tuning the dimensionality of the system, we find regions of parameter space with surprising stability in the form of standing waves traveling amongst the slow oscillators. The boundaries of these stable regions fluctuate regularly with the number of slow oscillators. These results demonstrate hidden order in the Lorenz '96 system, strengthening the evidence for its role as a hallmark representative of nonlinear dynamical behavior. Chris Danforth, Lewis Mitchell, Morgan Frank, Peter Sheridan Dodds. Nature Scientific Reports, 2625, 3, 2013. The patterns of life exhibited by large populations have been described and modeled both as a basic science exercise and for a range of applied goals such as reducing automotive congestion, improving disaster response, and even predicting the location of individuals. However, these studies previously had limited access to conversation content, rendering changes in expression as a function of movement invisible. In addition, they typically use the communication between a mobile phone and its nearest antenna tower to infer position, limiting the spatial resolution of the data to the geographical region serviced by each cellphone tower. We use a collection of 37 million geolocated tweets to characterize the movement patterns of 180,000 individuals, taking advantage of several orders of magnitude of increased spatial accuracy relative to previous work. Employing the recently developed sentiment analysis instrument known as the hedonometer, we characterize changes in word usage as a function of movement, and find that expressed happiness increases logarithmically with distance from an individual's average location. Chris Danforth, Kameron D. Harris, Lewis Mitchell, Morgan Frank, Peter Sheridan Dodds. PLoS ONE, e64417, 8, 2013. We conduct a detailed investigation of correlations between real-time expressions of individuals made across the United States and a wide range of emotional, geographic, demographic, and health characteristics. We do so by combining (1) a massive, geo-tagged data set comprising over 80 million words generated over the course of several recent years on the social network service Twitter and (2) annually-surveyed characteristics of all 50 states and close to 400 urban populations. Among many results, we generate taxonomies of states and cities based on their similarities in word use; estimate the happiness levels of states and cities; correlate highly-resolved demographic characteristics with happiness levels; and connect word choice and message length with urban characteristics such as education levels and obesity rates. Our results show how social media may potentially be used to estimate real-time levels and changes in population-level measures such as obesity rates. Daniel Brown, Chris Danforth. 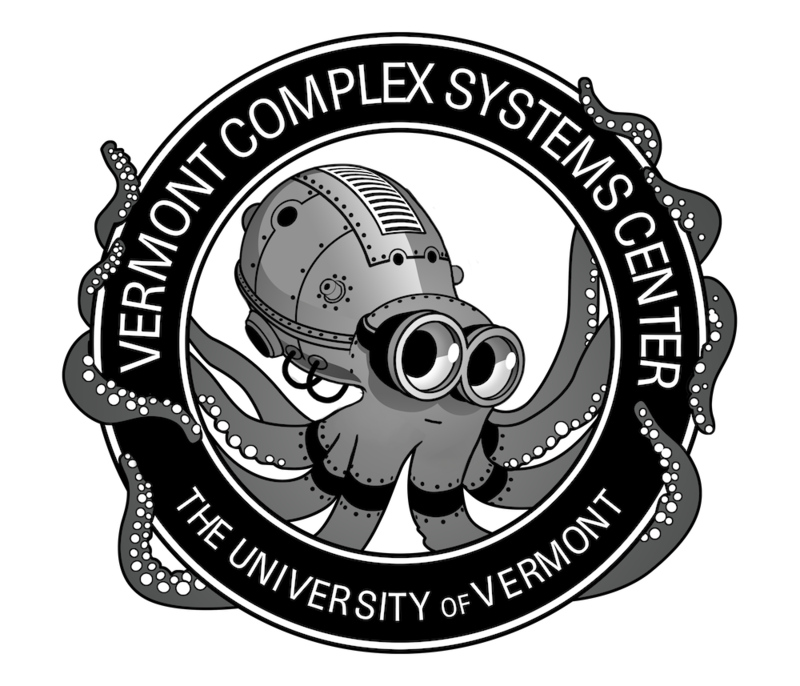 University of Vermont Transportation Research Center, , , 2013. The two-dimensional traffic model of Biham, Middleton and Levine (Phys. Rev. A, 1992) is a simple cellular automaton that exhibits a wide range of complex behavior. It consists of both northbound and eastbound cars traveling on a rectangular array of cells, each cell equipped with a traffic signal. The traffic signals switch synchronously from allowing northbound flow to eastbound flow. By gating individual traffic signals, ie allowing individual traffic signals to break from synchrony in predetermined, deterministic scenarios based on the local state of traffic, the range for which the system self-organizes into a state of unimpeded flow is extended. On a 100x100 cell array, this additional intelligence enables accomodation of 200 cars more than the original BML model, without any reduction in average velocity. Chris Danforth, Kameron D. Harris, Peter Sheridan Dodds. Physical Review E, , , 2013. We study binary state dynamics on a network where each node acts in response to the average state of its neighborhood. Allowing varying amounts of stochasticity in both the network and node responses, we find different outcomes in random and deterministic versions of the model. In the limit of a large, dense network, however, we show that these dynamics coincide. We construct a general mean field theory for random networks and show this predicts that the dynamics on the network are a smoothed version of the average response function dynamics. Thus, the behavior of the system can range from steady state to chaotic depending on the response functions, network connectivity, and update synchronicity. As a specific example, we model the competing tendencies of imitation and non-conformity by incorporating an off-threshold into standard threshold models of social contagion. In this way we attempt to capture important aspects of fashions and societal trends. We compare our theory to extensive simulations of this 'limited imitation contagion' model on Poisson random graphs, finding agreement between the mean-field theory and stochastic simulations. Chris Danforth, Darren Lee Hitt, William F. Louisos. International Journal of Heat and Mass Transfer, , , 2013. This computational study investigates the nonlinear dynamics of unstable convection in a 2D thermal convection loop (i.e., thermosyphon) with heat flux boundary conditions. The lower half of the thermosyphon is subjected to a positive heat flux into the system while the upper half is cooled by an equal-but-opposite heat flux out of the system. Water is employed as the working fluid with fully temperature dependent thermophysical properties and the system of governing equations is solved using a finite volume method. Numerical simulations are performed for varying levels of heat flux and varying strengths of gravity to yield Rayleigh numbers ranging from 1.5 × 10^2 to 2.8 × 10^7. Simulation results demonstrate that multiple regimes are possible and include: (1) conduction, (2) damped, stable convection that asymptotes to steady-state, (3) unstable, Lorenz-like chaotic convection with flow reversals, and (4) high Rayleigh, aperiodic stable convection without flow reversals. Delineation of the various flow regimes, as characterized by the temporal evolution of bulk mass flow rate, is obtained in terms of heat flux, gravity, and the Rayleigh number. Temporal frequencies of the oscillatory behavior and residence time in a circulatory direction are explored and described for the various thermal and gravitational forcing (Rayleigh number) applied to the system. Chris Danforth, Elizabeth E. Crone, Jane Molofsky. Population Ecology, , , 2013. Controlling weed populations requires an understanding of their underlying population dynamics which can be achieved through a combination of model development and long-term studies. In this paper, we develop models based on long-term data from experimental populations of the weedy annual plant Cardamine pensylvanica. Four replicate populations of C. pensylvanica were grown in growth chambers under three different nutrient levels but with all other environmental conditions held constant. We analyze the resulting time series using generalized additive models and perform stability analyses using Lyapunov exponents. Further, we test whether the proposed mechanism, delayed density dependence caused by maternal effects, is operating in our system by experimentally manipulating maternal density and assessing the resulting offspring quality. Our results show that that increasing the frequency of nutrients causes plant population dynamics to shift from stable to damped 2-point oscillations to longer cycles. This shift in population dynamics is due to a shift at high nutrients from populations being regulated by first order density feedbacks to being regulated by both first order and second order density feedbacks. A consequence of these first order and second order feedbacks was an increase in cycle lengths as demonstrated by the presence of complex eigenvalues. A short-term experiment confirmed that when grown under high nutrients, the density of maternal plants strongly affected offspring size, providing a mechanism whereby these second order density feedbacks could operate. Our results demonstrate that increasing nutrient frequency results in a qualitative shift in dynamics from stable to longer cycles. Kameron D. Harris, Chris Danforth, Peter Sheridan Dodds. Physical Review E, , 88, 2013. We study binary state dynamics on a network where each node acts in response to the average state of its neighborhood. By allowing varying amounts of stochasticity in both the network and node responses, we find different outcomes in random and deterministic versions of the model. In the limit of a large, dense network, however, we show that these dynamics coincide. We construct a general mean-field theory for random networks and show this predicts that the dynamics on the network is a smoothed version of the average response function dynamics. Thus, the behavior of the system can range from steady state to chaotic depending on the response functions, network connectivity, and update synchronicity. As a specific example, we model the competing tendencies of imitation and nonconformity by incorporating an off-threshold into standard threshold models of social contagion. In this way, we attempt to capture important aspects of fashions and societal trends. We compare our theory to extensive simulations of this “limited imitation contagion” model on Poisson random graphs, finding agreement between the mean-field theory and stochastic simulations. Chris Danforth, Eduardo Cotilla-Sanchez, Paul Hines. IEEE Transactions on Smart Grid, , , 2012. The dynamical behavior of power systems under stress frequently deviates from the predictions of deterministic models. Model-free methods for detecting signs of excessive stress before instability occurs would therefore be valuable. The mathematical frameworks of fast-slow systems and critical slowing down can describe the statistical behavior of dynamical systems that are subjected to random perturbations as they approach points of instability. This paper builds from existing literature on fast-slow systems to provide evidence that time series data alone can be useful to estimate the temporal distance of a power system to a critical transition, such as voltage collapse. Our method is based on identifying evidence of critical slowing down in a single stream of synchronized phasor measurements. Results from a single machine, stochastic infinite bus model, a three machine/nine bus system and the Western North American disturbance of 10 August 1996 illustrate the utility of the proposed method. Chris Danforth, Darren Lee Hitt, El Hassan Ridouane, Kameron D. Harris. Tellus, , , 2012. A simplified model of natural convection, similar to the Lorenz system, is compared to computational fluid dynamics simulations of a thermosyphon in order to test data assimilation (DA) methods and better understand the dynamics of convection. The thermosyphon is represented by a long time flow simulation, which serves as a reference ‘truth’. Forecasts are then made using the Lorenz-like model and synchronised to noisy and limited observations of the truth using DA. The resulting analysis is observed to infer dynamics absent from the model when using short assimilation windows. Furthermore, chaotic flow reversal occurrence and residency times in each rotational state are forecast using analysis data. Flow reversals have been successfully forecast in the related Lorenz system, as part of a perfect model experiment, but never in the presence of significant model error or unobserved variables. Finally, we provide new details concerning the fluid dynamical processes present in the thermosyphon during these flow reversals. Chris Danforth, Ross M. Lieb-Lappen. Physica D, , , 2012. Predictions of the future state of the Earth’s atmosphere suffer from the consequences of chaos: numerical weather forecast models quickly diverge from observations as uncertainty in the initial state is amplified by nonlinearity. One measure of the utility of a forecast is its shadowing time, informally given by the period of time for which the forecast is a reasonable description of reality. The present work uses the Lorenz '96 coupled system, a simplified nonlinear model of atmospheric dynamics, to extend a recently developed technique for lengthening the shadowing time of a dynamical system. Ensemble forecasting is used to make forecasts with and without inflation, a method whereby the ensemble is regularly expanded artificially along dimensions whose uncertainty is contracting. The first goal of this work is to compare model forecasts, with and without inflation, to a true trajectory created by integrating a modified version of the same model. The second goal is to establish whether inflation can increase the maximum shadowing time for a single optimal member of the ensemble. In the second experiment the true trajectory is known a priori, and only the closest ensemble members are retained at each time step, a technique known as stalking. Finally, a targeted inflation is introduced to both techniques to reduce the number of instances in which inflation occurs in directions likely to be incommensurate with the true trajectory. Results varied for inflation, with success dependent upon the experimental design parameters (e.g. size of state space, inflation amount). However, a more targeted inflation successfully reduced the number of forecast degradations without significantly reducing the number of forecast improvements. Utilized appropriately, inflation has the potential to improve predictions of the future state of atmospheric phenomena, as well as other physical systems. Chris Danforth, Kameron D. Harris, Nick Allgaier. Physical Review E, , , 2012. Improving the accuracy of forecast models for physical systems such as the atmosphere is a crucial ongoing effort. The primary focus of recent research on these highly nonlinear systems has been errors in state estimation, but as that error has been successfully diminished, the role of model error in forecast uncertainty has duly increased. The present study is an investigation of an empirical model correction procedure involving the comparison of short forecasts with a reference 'truth' system during a training period, in order to calculate systematic (1) state-independent model bias and (2) state-dependent error patterns. An estimate of the likelihood of the latter error component is computed from the current state at every time step of model integration. The effectiveness of this technique is explored in a realistic scenario, in which the model is structurally different (in dynamics, dimension, and parametrization) from the target system. Results suggest that the correction procedure is more effective for reducing error and prolonging forecast usefulness than parameter tuning. However, the cost of this increase in average forecast accuracy is the creation of substantial qualitative differences between the dynamics of the corrected model and the true system. A method to mitigate dynamical ramifications and further increase forecast accuracy is presented. Chris Danforth, Kameron D. Harris, Peter Sheridan Dodds. Physical Review Letters, 158701, 110, 2013. We study a family of binary state, socially-inspired contagion models which incorporate imitation limited by an aversion to complete conformity. We uncover rich behavior in our models whether operating with probabilistic or deterministic individual response functions, both on dynamic or fixed random networks. In particular, we find significant variation in the limiting behavior of a population's infected fraction, ranging from steady-state to chaotic. We show that period doubling arises as we increase the average node degree, and that the universality class of this well known route to chaos depends on the interaction structure of random networks rather than the microscopic behavior of individual nodes. We find that increasing the fixedness of the system tends to stabilize the infected fraction, yet disjoint, multiple equilibria are possible depending solely on the choice of the initially infected node. Chris Danforth, Kathleen E. Brummel-Ziedins, Kenneth Mann, Stephen J. Everse, Thomas Orfeo. PLoS ONE, , , 2012. In terms of its soluble precursors, the coagulation proteome varies quantitatively among apparently healthy individuals. The significance of this variability remains obscure, in part because it is the backdrop against which the hemostatic consequences of more dramatic composition differences are studied. In this study we have defined the consequences of normal range variation of components of the coagulation proteome by using a mechanism-based computational approach that translates coagulation factor concentration data into a representation of an individual's thrombin generation potential. A novel graphical method is used to integrate standard measures that characterize thrombin generation in both empirical and computational models (e.g max rate, max level, total thrombin, time to 2 nM thrombin ('clot time')) to visualize how normal range variation in coagulation factors results in unique thrombin generation phenotypes. Unique ensembles of the 8 coagulation factors encompassing the limits of normal range variation were used as initial conditions for the computational modeling, each ensemble representing 'an individual' in a theoretical healthy population. These 'individuals' with unremarkable proteome composition was then compared to actual normal and 'abnormal' individuals, i.e. factor ensembles measured in apparently healthy individuals, actual coagulopathic individuals or artificially constructed factor ensembles representing individuals with specific factor deficiencies. A sensitivity analysis was performed to rank either individual factors or all possible pairs of factors in terms of their contribution to the overall distribution of thrombin generation phenotypes. Key findings of these analyses include: normal range variation of coagulation factors yields thrombin generation phenotypes indistinguishable from individuals with some, but not all, coagulopathies examined; coordinate variation of certain pairs of factors within their normal ranges disproportionately results in extreme thrombin generation phenotypes, implying that measurement of a smaller set of factors may be sufficient to identify individuals with aberrant thrombin generation potential despite normal coagulation proteome composition. Chris Danforth, Darren Lee Hitt, El Hassan Ridouane. International Journal of Heat and Mass Transfer, , , 2011. Transient laminar natural convection regimes occurring in a thermal convection loop heated from below and cooled from above are investigated numerically for a wide range of Rayleigh numbers spanning the interval from 10^3 to 2.6 × 10^7. In the model system, the lower half of the loop is heated and maintained at a constant high temperature, while the upper half is cooled and maintained at a constant low temperature. A three-dimensional numerical model based on the finite volume method is used to solve the system of governing flow equations. Simulations are performed using water as the working fluid (Pr = 5.83) and detailed numerical results are presented and discussed for conduction, steady convection, and unsteady flow regimes. Although this subject has attracted researchers for decades, there have been no detailed three-dimensional numerical simulations of the dynamics of flow in the thermal convection loop. The objective of the present study is to fill this gap by presenting the temporal evolution of the velocity and temperature fields at key locations within the system. Emphasis is given to the analysis of dynamical behavior of the flow during the unsteady regime. The complexity of flow in the loop, which is characterized by vertical structures and flow recirculation, is visualized for the first time by performing detailed 3-D numerical simulations. Cathy Bliss, Chris Danforth, Isabel Kloumann, Kameron D. Harris, Peter Sheridan Dodds. Journal of Computational Science, 388-397, 3, 2012. The advent of social media has provided an extraordinary, if imperfect, 'big data' window into the form and evolution of social networks. Based on nearly 40 million message pairs posted to Twitter between September 2008 and February 2009, we construct and examine the revealed social network structure and dynamics over the time scales of days, weeks, and months. At the level of user behavior, we employ our recently developed hedonometric analysis methods to investigate patterns of sentiment expression. We find users' average happiness scores to be positively and significantly correlated with those of users one, two, and three links away. We strengthen our analysis by proposing and using a null model to test the effect of network topology on the assortativity of happiness. We also find evidence that more well connected users write happier status updates, with a transition occurring around Dunbar's number. More generally, our work provides evidence of a social sub-network structure within Twitter and raises several methodological points of interest with regard to social network reconstructions. Cathy Bliss, Chris Danforth, Isabel Kloumann, Kameron D. Harris, Peter Sheridan Dodds. PLoS ONE, e29484, 7, 2012. Within the last million years, human language has emerged and evolved as a fundamental instrument of social communication and semiotic representation. People use language in part to convey emotional information, leading to the central and contingent questions: (1) What is the emotional spectrum of natural language? and (2) Are natural languages neutrally, positively, or negatively biased? Previous findings are mixed: suggestive evidence of a positive bias has been found in small samples of English words [1-3], framed as the Pollyanna Hypothesis  and Linguistic Positivity Bias , while the experimental elicitation of emotional words has instead found a strong negative bias . Here, we report that the human-perceived positivity of over 10,000 of the most frequently used English words exhibits a clear positive bias. More deeply, we characterize and quantify distributions of word positivity for four large and distinct corpora, demonstrating that their form is surprisingly invariant with respect to frequency of word use. Cascading Failures: Extreme Properties of Large Blackouts in the Electric Grid. Benjamin O'Hara, Chris Danforth, Eduardo Cotilla-Sanchez, Paul Hines. Math Awareness Month, , , 2011. Power grids are almost universally agreed to be complex systems, which means that it is not possible to fully understand the grid by just looking at its parts. Power grids, which we define here to include all of the physical infrastructure and human individuals and organizations that jointly work to produce, distribute and consume electricity, have many properties that are common to other complex systems. Like the international financial system, power grids are operated by many millions of physical (hardware/software) and human agents. Like the Internet, power systems are frequently subjected to both random failure and malicious attack. Like the weather systems interacting to form hurricanes, there are strong, non-linear connections among the components, and between the components and society at large. And power systems occasionally exhibit spectacularly large, and costly, failures. This essay attempts to help us to understand these failures by highlighting key mathematical properties of cascading failures in complex systems in general, and in power grids in particular. We focus particularly on the mathematical challenges of measuring cascading failure risk in large power grids, and discuss some techniques that may provide better information to power grid operators regarding cascading failure risk. Temporal patterns of happiness and information in a global social network: Hedonometrics and Twitter. Cathy Bliss, Chris Danforth, Isabel Kloumann, Kameron D. Harris, Peter Sheridan Dodds. PLoS ONE, e26752, 6, 2011. Individual happiness is a fundamental societal metric. Normally measured through self-report, happiness has often been indirectly characterized and overshadowed by more readily quantifiable economic indicators, such as gross domestic product. Here, we use a real-time, remote-sensing, non-invasive, text-based approach&emdash;a kind of hedonometer&emdash;to uncover collective dynamical patterns of happiness levels expressed by over 50 million users in the online, global social network Twitter. With a data set comprising nearly 2.8 billion expressions involving more than 28 billion words, we explore temporal variations in happiness, as well as information levels, over time scales of hours, days, and months. Among many observations, we find a steady global happiness level, evidence of universal weekly and daily patterns of happiness and information, and that happiness and information levels are generally uncorrelated. We also extract and analyse a collection of happiness and information trends based on keywords, showing them to be both sensible and informative, and in effect generating opinion polls without asking questions. Finally, we develop and employ a graphical method that reveals how individual words contribute to changes in average happiness between any two texts. The interplay of chaos between the terrestrial and giant planets. Anton V. Malykh, Chris Danforth, Wayne B. Hayes. Monthly Notices of the Royal Astronomical Society, , , 2010. We report on some simple experiments on the nature of chaos in our planetary system. We make the following interesting observations. First, we look at the system of Sun four Jovian planets as an isolated five-body system interacting only via Newtonian gravity. We find that if we measure the Lyapunov time of this system across thousands of initial conditions all within observational uncertainty, then the value of the Lyapunov time seems relatively smooth across some regions of initial condition space, while in other regions it fluctuates wildly on scales as small as we can reliably measure using numerical methods. This probably indicates a fractal structure of Lyapunov exponents measured across initial condition space. Then, we add the four inner terrestrial planets and several post-Newtonian corrections such as general relativity into the model. In this more realistic Sun eight-planet system, we find that the above structure of chaos for the outer planets becomes uniformly chaotic for almost all planets and almost all initial conditions, with a Lyapunov time-scale of about 5–20 Myr. This seems to indicate that the addition of the inner planets adds more chaos to the system. Finally, we show that if we instead remove the outer planets and look at the isolated five-body system of the Sun four terrestrial planets, then the terrestrial planets alone show no evidence of chaos at all, over a large range of initial conditions inside the observational error volume. We thus conclude that the uniformity of chaos in the outer planets comes not from the inner planets themselves, but from the interplay between the outer and inner ones. Interestingly, however, there exist rare and isolated initial conditions for which one individual outer planetary orbit may appear integrable over a 200-Myr time-scale, while all the other planets simultaneously appear chaotic. Measuring the Happiness of Large-Scale Written Expression: Songs, Blogs, and Presidents. Chris Danforth, Peter Sheridan Dodds. Journal of Happiness Studies, 444-456, 11, 2010. The importance of quantifying the nature and intensity of emotional states at the level of populations is evident: we would like to know how, when, and why individuals feel as they do if we wish, for example, to better construct public policy, build more successful organizations, and, from a scientific perspective, more fully understand economic and social phenomena. Here, by incorporating direct human assessment of words, we quantify happiness levels on a continuous scale for a diverse set of large-scale texts: song titles and lyrics, weblogs, and State of the Union addresses. Our method is transparent, improvable, capable of rapidly processing Web-scale texts, and moves beyond approaches based on coarse categorization. Among a number of observations, we find that the happiness of song lyrics trends downward from the 1960's to the mid 1990's while remaining stable within genres, and that the happiness of blogs has steadily increased from 2005 to 2009, exhibiting a striking rise and fall with blogger age and distance from the equator. A 2-D numerical study of chaotic flow in a natural convection loop. Chris Danforth, Darren Lee Hitt, El Hassan Ridouane. International Journal of Heat and Mass Transfer, , , 2009. This paper numerically investigates the nonlinear dynamics of the unstable convection regime of the thermal convection loop, an experimental analogue of the Lorenz model. The lower half of the toroidal loop is heated and maintained at a constant high temperature, while the upper half is cooled at a constant low temperature. Subject to the proper boundary conditions, the system of governing equations is solved using a finite volume method. The numerical simulations are performed for water corresponding to Pr = 5.83 and Rayleigh number varying from 1000 to 150,000. In the case of a loop heated from below and cooled from above, it has been demonstrated theoretically and experimentally in the literature that multiple flow regimes are possible. Numerical results in terms of streamlines, isotherms, and local heat flux distributions along the walls are presented for each flow regime. Although several studies have investigated the chaotic regime of convection loops, there have been no detailed numerical simulations of the dynamics of flow reversals. Fine-scale flow behavior during the transition from one flow direction to another is illustrated by the temporal evolution of temperature distribution, mass flow rate, and local heat flux at selected locations in the system. Issues related to the observed Kelvin–Helmholtz instabilities are discussed. Accounting for Model Errors in Ensemble Data Assimilation. Chris Danforth, Eugenia Kalnay, Hong Li, Takemasa Miyoshi. Monthly Weather Review, , , 2009. This study addresses the issue of model errors with the ensemble Kalman filter. Observations generated from the NCEP–NCAR reanalysis fields are assimilated into a low-resolution AGCM. Without an effort to account for model errors, the performance of the local ensemble transform Kalman filter (LETKF) is seriously degraded when compared with the perfect-model scenario. Several methods to account for model errors, including model bias and system noise, are investigated. The results suggest that the two pure bias removal methods considered [Dee and Da Silva (DdSM) and low dimensional (LDM)] are not able to beat the multiplicative or additive inflation schemes used to account for the effects of total model errors. In contrast, when the bias removal methods are augmented by additive noise representing random errors (DdSM and LDM ), they outperform the pure inflation schemes. Of these augmented methods, the LDM , where the constant bias, diurnal bias, and state-dependent errors are estimated from a large sample of 6-h forecast errors, gives the best results. The advantage of the LDM over other methods is larger in data-sparse regions than in data-dense regions. Complex Dynamic Behavior During Transition in a Solid Combustion Model. Chris Danforth, Jun Yu, Laura K. Gross. Complexity, , , 2009. Through examples in a free-boundary model of solid combustion, this study concerns nonlinear transition behavior of small disturbances of front propagation and temperature as they evolve in time. This includes complex dynamics of period doubling, and quadrupling, and it eventually leads to chaotic oscillations. Within this complex dynamic domain we also observe a period six-folding. Both asymptotic and numerical solutions are studied.We show that for special parameters our asymptotic method with some dominant modes captures the formation of coherent structures. Finally, we discuss possible methods to improve our prediction of the solutions in the chaotic case. Dynamic Structure of Networks Updated According to Simple, Local Rules. Chris Danforth, Todd Rowland. Physical Review E, , , 2009. While most studies of deterministic network growth have been of one- or two-case models, here a more diverse and comprehensive method of deterministic network evolution is presented. The range of observed behavior is classified and the underlying causes of the various types of growth are investigated. The potential for prediction of the different types of network growth is also examined. It is discovered that a wide variety of behavior can be produced by a simple evolutionary setup and that the networks resulting from this method of evolution warrant further study. The Impact of Uncertainty in a Blood Coagulation Model. Chris Danforth, Kathleen E. Brummel-Ziedins, Kenneth Mann, Stephen J. Everse, Thomas Orfeo. Mathematical Medicine and Biology, , , 2009. Deterministic mathematical models of biochemical processes operate as if the empirically derived rate constants governing the dynamics are known with certainty. Our objective in this study was to explore the sensitivity of a deterministic model of blood coagulation to variations in the values of its 44 rate constants. This was accomplished for each rate constant at a given time by defining a normalized ensemble standard deviation that accounted for the sensitivity of the predicted concentration of each protein species to variation in that rate constant (from 10 to 1000% of the accepted value). A mean coefficient of variation derived from the normalized ensemble standard deviation values for all protein species was defined to quantify the overall variation introduced into the model's predictive capacity at that time by the assumed uncertainty in that rate constant. A time-average value of the coefficient of variation over the 20-min simulation for each rate constant was then used to rank rate constants. The model's predictive capacity is particularly sensitive (50% of the aggregate variation) to uncertainty in five rate constants involved in the regulation of the formation and function of the factor VIIa–tissue factor complex. Therefore, our analysis has identified specific rate constants to which the predictive capability of this model is most sensitive and thus where improvements in measurement accuracy will yield the greatest increase in predictive capability. Impact of Online Empirical Model Correction on Nonlinear Error Growth. Chris Danforth, Eugenia Kalnay. Geophysical Research Letters, , , 2008. The purpose of this study is to compare two methods of correcting the bias of a GCM; namely statistical correction performed a posteriori (offline) as a function of forecast length, and correction done within the model integration (online). The model errors of a low resolution GCM are estimated by the 6-hour forecast residual averaged over several years and used to correct the model. Both the offline and online corrections substantially reduce the model bias when applied to independent data. Their performance in correcting the model error is comparable at all lead times, but for lead times longer than 1-day the online corrected forecasts have smaller RMS forecast errors and larger anomaly correlations than offline corrected forecasts. These results indicate that the online correction reduces not only the growth of the bias but also the nonlinear growth of non-constant (state-dependent and random) forecast errors during the model integration. Using Singular Value Decomposition to Parameterize State-Dependent Model Errors. Chris Danforth, Eugenia Kalnay. Journal of Atmospheric Sciences, , , 2008. The purpose of the present study is to use a new method of empirical model error correction, developed by Danforth et al. in 2007, based on estimating the systematic component of the nonperiodic errors linearly dependent on the anomalous state. The method uses singular value decomposition (SVD) to generate a basis of model errors and states. It requires only a time series of errors to estimate covariances and uses negligible additional computation during a forecast integration. As a result, it should be suitable for operational use at a relatively small computational expense. The method is tested with the Lorenz ’96 coupled system as the truth and an uncoupled version of the same system as a model. The authors demonstrate that the SVD method explains a significant component of the effect that the model’s unresolved state has on the resolved state and shows that the results are better than those obtained with Leith’s empirical correction operator. The improvement is attributed to the fact that the SVD truncation effectively reduces sampling errors. Forecast improvements of up to 1000% are seen when compared with the original model. The improvements come at the expense of weakening ensemble spread. Estimating and Correcting Global Weather Model Error. Chris Danforth, Eugenia Kalnay, Takemasa Miyoshi. Monthly Weather Review, , , 2007. The purpose of the present study is to explore the feasibility of estimating and correcting systematic model errors using a simple and efficient procedure, inspired by papers by Leith as well as DelSole and Hou, that could be applied operationally, and to compare the impact of correcting the model integration with statistical corrections performed a posteriori. An elementary data assimilation scheme (Newtonian relaxation) is used to compare two simple but realistic global models, one quasigeostrophic and one based on the primitive equations, to the NCEP reanalysis (approximating the real atmosphere). The 6-h analysis corrections are separated into the model bias (obtained by time averaging the errors over several years), the periodic (seasonal and diurnal) component of the errors, and the nonperiodic errors. An estimate of the systematic component of the nonperiodic errors linearly dependent on the anomalous state is generated.Forecasts corrected during model integration with a seasonally dependent estimate of the bias remain useful longer than forecasts corrected a posteriori. The diurnal correction (based on the leading EOFs of the analysis corrections) is also successful. State-dependent corrections using the full-dimensional Leith scheme and several years of training actually make the forecasts worse due to sampling errors in the estimation of the covariance. A sparse approximation of the Leith covariance is derived using univariate and spatially localized covariances. The sparse Leith covariance results in small regional improvements, but is still computationally prohibitive. Finally, singular value decomposition is used to obtain the coupled components of the correction and forecast anomalies during the training period. The corresponding heterogeneous correlation maps are used to estimate and correct by regression the state-dependent errors during the model integration. Although the global impact of this computationally efficient method is small, it succeeds in reducing state-dependent model systematic errors in regions where they are large. The method requires only a time series of analysis corrections to estimate the error covariance and uses negligible additional computation during a forecast. As a result, it should be suitable for operational use at relatively small computational expense. Making Forecasts for Chaotic Physical Processes. Chris Danforth, James A. Yorke. Physical Review Letters, , , 2006. Making a prediction for a chaotic physical process involves specifying the probability associated with each possible outcome. Ensembles of solutions are frequently used to estimate this probability distribution. However, for a typical chaotic physical system H and model L of that system, no solution of L remains close to H for all time. We propose an alternative. This Letter shows how to inflate or systematically perturb the ensemble of solutions of L so that some ensemble member remains close to H for orders of magnitude longer than unperturbed solutions of L. This is true even when the perturbations are significantly smaller than the model error. How do we find life's benchmark?